Thanks to Douglas Zemeckis, Ph.D. County Agent III (Assistant Professor) for the Marine Extension Agent for Ocean, Atlantic, and Monmouth Counties for this information. I'm sending a reminder about the next seminar as a part of our Marine Extension Program Seminar Series (MEPSS), which will be next Monday (10/29) from 7:00 - 8:30 PM. "Increasing Resilience Along New Jersey's Coastal Zone"
Come learn about the programs and research that Lisa and her colleagues are doing at the Jacques Cousteau National Estuarine Research Reserve as it relates to coastal resiliency, climate change, and sea level rise, including how you could help make a difference and potentially get involved. Please see the email below for additional details. 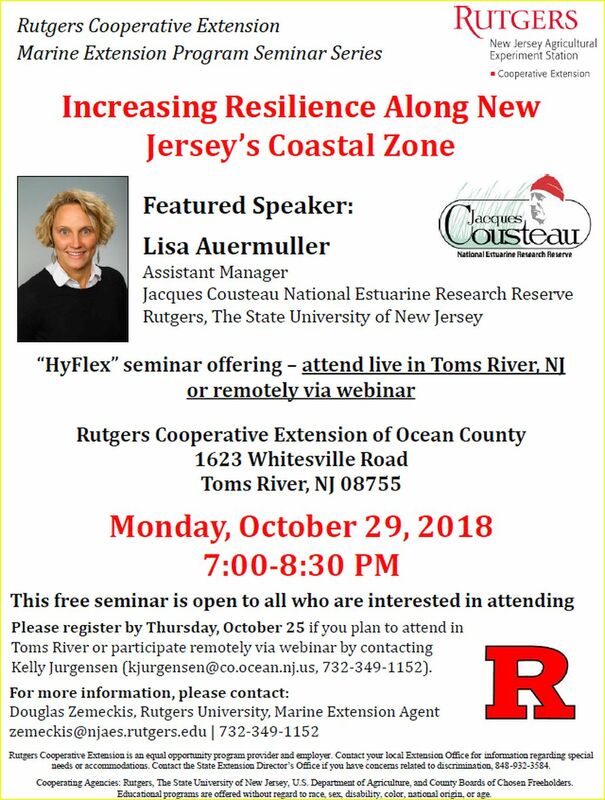 Those who are interested can participate live by coming to the Rutgers Cooperative Extension of Ocean County in Toms River, NJ or remotely via webinar. Please RSVP to Kelly Jurgensen if you plan to participate (kjurgensen@co.ocean.nj.us | 732-349-1152). Feel free to pass this announcement on to anyone who you think might be interested and to reach out to us if you have any questions.